Blending perfectly with any decor, the Kharis ultrasonic diffuser offers a colour changing mood lighting aiding relaxation. This elegant diffuser will scent your living space by dispersing the fragrance of your choice whilst scattering light around your room. Comes with one Free Blue Labelle essential oil of your choice, up to the value of £8. Add your choice in the comments box at checkout choosing from Sweet Orange, Peppermint, Tea Tree, Rosemary, Lavender or Bergamot. Shipping worldwide with Free UK delivery. From Greek mythology, Kharis, one of the three graces often seen as the Goddess of charm and beauty. Associated with Aphrodite and a daughter of Zeus, Kharis denotes the personification of grace and was known for singing and dancing for the Gods with her sisters. The Kharis Aroma Diffuser from madebyzen embodies grace and beauty with style and elegance. 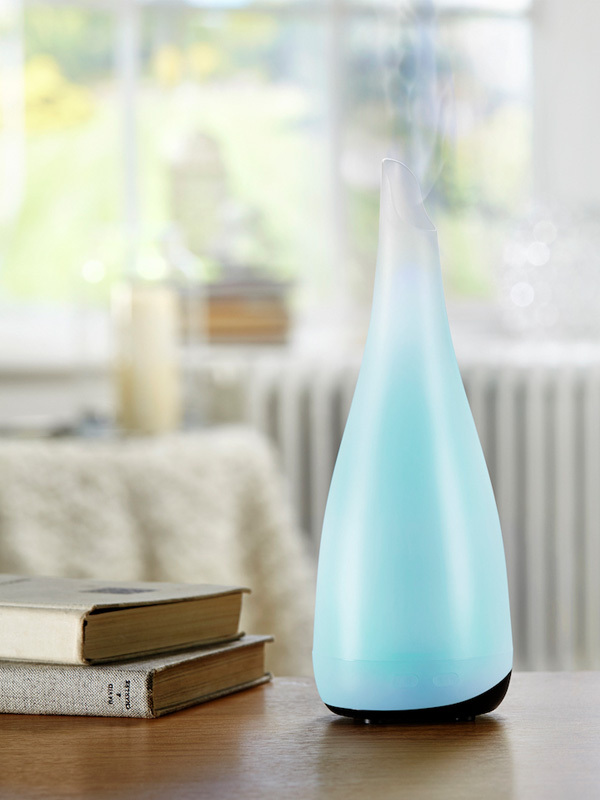 By placing tap water and a few drops of your favourite Essential or Fragrance oil into the electric diffuser, it will, with the press of a button, instantly release a heatless, completely safe, fine mist of scented vapour into the atmosphere to stimulate your senses and enable you to sink into a relaxed world of healing and self-balance. This is believed to be the best way to diffuse any fragrance into the atmosphere, as without direct heat, essential oils are not degraded. The Kharis offers a range of functions which make it versatile for any setting. The stunning colour changing mood light goes through a range of shades and the light can be paused on your preferred colour so you can delight in the steady glow that emits into your home. To fully immerse you into calm and tranquillity, the light and mist can be used at the same time. For night time, you can also use without the light, to send you into a gentle aroma enriched slumber. The mood light can also be used without the mist, making the Kharis a decorative mood lamp or ideal night light. It also boasts intermittent misting mode, ideal for using stronger scents or where extended use is required. The Kharis ultrasonic diffuser automatically shuts off when the water falls below a certain level, effecting complete safety and ideal for use around children or pets. Add water to the tank with 2-4 drops of essential oil or fragrance oil. It is advised that you empty out your diffuser and wipe it dry with a cloth every few days, in order to reduce any damage that could be caused by essential oils collecting on the ultrasonic disc. This will occur especially with citrus oils. This type of damage is not covered under the manufacturer’s warranty.